Join us as we count down to an hour of lights-off to mark Earth Hour, an annual celebration at the mall. Shoppers can look forward to a line-up of family activities such as recycling and grasshopper making workshops, exhibits, a free movie screening, as well as take part in a quiz to walk away with a Water Wally keychain. The lights of selected areas around the mall and other non-essential lights will be switched off for an hour, as part of City Square Mall’s commitment to environmental sustainability. Let your creative juices flow and create your own DIY musical instruments at the Bottle Music Instrument-making Workshop. The first 200 shoppers to register at the venue will be provided with recycled bottles and materials to customize their personal instruments. Shoppers can also take part in the Grasshopper-making Workshop conducted by students of Woodgrove Secondary School. Plus, shoppers can learn more about climate change, water conservation and how they can protect the planet at the exhibits, in collaboration with the Public Utilities Board (PUB). Before the lights go off, put your knowledge to test with an interactive stage quiz and stand to win a Water Wally keychain! Then, join us as we countdown to Earth Hour at 8.30pm where non-essential lights will be switched off for an hour. 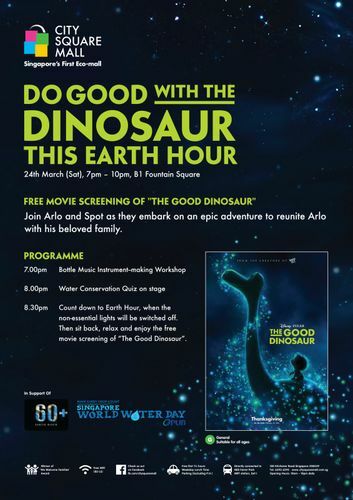 After ‘lights off’, sit back and relax with a free movie screening of ‘The Good Dinosaur’. Join Arlo and Spot as they embark on an epic adventure to reunite Arlo with his beloved family. Travel back to 65,000,000 years ago as the story about self-discovery, facing (and living with) your fears and love unfolds. For more details on the activities and promotions, visit City Square Mall website or check out City Square Mall’s Facebook page.